After Bridlington and Scarborough, our next and final stop was the seaside town of Whitby. Whitby is situated on the Yorkshire Coast. As we drove into Whitby, we were immediately drawn towards this magnificent building that was dominating the skyline, hanging from the blue skies almost like a beautiful painting. With its misty grey charm and pointed arches, it was beckoning us to come closer and explore; and like hypnotised or entranced patients we succumbed and drove closer and closer. Once parked up, we peered over the wall and admired the ruins of Whitby Abbey. Whitby Abbey is reputed to have inspired Bram Stoker to write the world famous book 'Dracula'. With a little imagination, I could understand how this place could easily be transformed from idyllic calm to haunting charm. Whilst admiring the beauty of the Abbey, I was suddenly reminded of an old friends affection for Whitby. Every year since the late 1990s, my Goth friend J with his wife and friends would pay homage to Whitby for the Whitby Gothic Weekend/Festival. I wonder if he still continues with this tradition as the last I saw of him he had become a Daddy. Anyway, I digress I wanted to go and explore this 'Gothic splendour' a little closer, but sadly Whitby Abbey was closed for the season, so all we do with many other tourists was admire it from the distant. Before we walked into the Parish churchyard of St Mary, we noted these allotment plots. D and me looked at each other and sighed. Every time I see an allotment plot, someone growing their own, momentarily my heart jumps with excitement; and then it sinks with sadness at the memory of the loss ours. But it makes me tremendously happy to see others enjoying their little patch of land. The Parish Church of St Mary stands on Whitbys East Cliff. If you click on the image below, you will see the intricate detail carved into the stone. We both first walked down the 199 steps that connects the parish church on the cliff top to the old town of Whitby below; and then we walked back up this famous landmark, which I have to say left me rather breathless. D took a photograph of me reaching the top: gasping, looking all huffed and puffed. Am I going to share it with you? Don't be silly, of course not! A view of the harbour below from the steep east cliffs of Whitby - don't get any closer... you don't want to slip up here. Once below in the old town of Whitby, you find yourself in a maze made up of alley ways and narrow streets that eventually lead to the busy Quayside. We did consider whether or not to stay in Whitby overnight, but as we are being careful with out pennies and pounds, we changed our minds and decided to continue driving up to Scotland. Oh it was a long drive home. Of course, I did a little window shopping and peered at a few independent shops. The only thing from Whitby I came home with though was a tub of 'tiger nuts'. 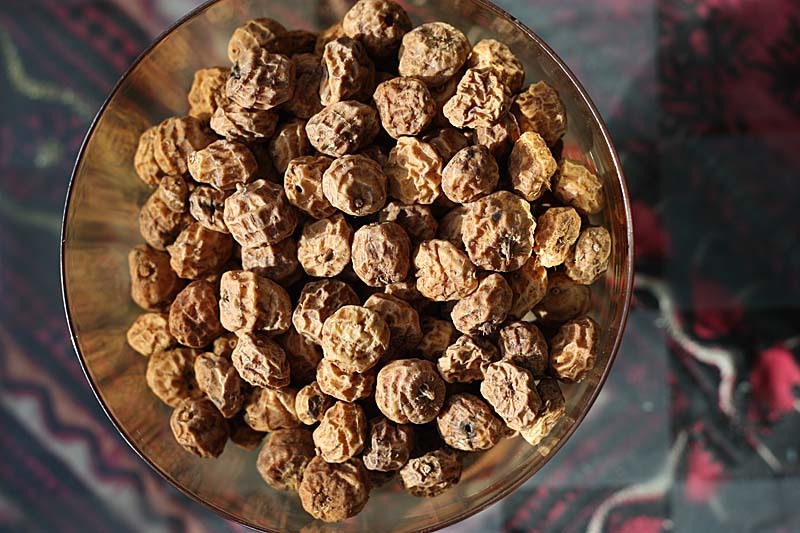 Tiger nuts are generally dried out to preserve them and have to be reconstituted in water before you can consume them. Obviously they taste nutty, but they also have a sugared sweetness which is not often found in nuts. 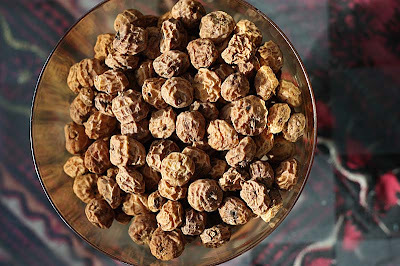 To learn more about Tiger nuts, follow this link. I'm not exactly sure what I am going to do with them, but if nothing creative comes to mind, I can always rely on Rose Elliot. She has a recipe where she makes milk from the tiger nuts. WOW! Whitby Abbey was a "coup de coeur" for us. It is fabulous. And the region is as well. We ate a delicious nutroast in a small pub near our B&B in a small village. Oh... I wish I was there! Oooh, I love Whitby! I'm so glad you managed the 199 steps! And is that First Seasons I see? I love that shop! They have lovely saurkraut there. I always stock up on Tiger nuts when I visit* they make a lovely drink called horchata, a cinnamon infused Mexican speciality that's really refreshing in the summer. It also makes really good cake too. I've so enjoyed reading about your travels, I hope you had a wonderful time! Thank you so much spécialiste de l'éphémère. So pleased this blog entry brought back some good memories for you. Thank you so, so much littleblackfox. Yes, thats me steppign into First Seasons. I had a good look, but came out with nothing. I picked up the tiger nuts from a different shop. Now my dear friend, as much as I like the sound of horchata - I am more tempted by cake. So you must give me your recipe, if you have one for Tiger nut cake and hopefully I have enough nuts to make it. By the way I don't recall seeing Carlin peas. Anyway, as Brief as they were, I enjoyed my travels too. PS I have a jar of Polish saurkraut in my cupboard to use up, its going to be used in a veggie stew recipe soon. Warm wishes dear friend. I think i could see myself falling in love with Whitby too - but held back. So I am not at all surprised that you have so many good memories of it, and spending your Silver Anniversary there says a lot. Although I had a good nosy round the Magpie Kitchen shop, we didn't stop at the Magpie Cafe or anywhere else to snack as it was flying visit. Who knows, I may get to explore it again. I am back in Scotland now. Its nice to travel, but i do miss my own bed. So how did you eat your tiger nuts? Whitby looks lovely, I've always wanted to go since my teenage goth days! Teenage days may be gone, but that shouldn't stop you from visiting it one-day and absorbing the vibe of the place. Thank you for your lovely and kind comment Johanna. Yes, I ertainly did and thankfully the weather was on our side. I am Whitby born & bred and have travelled the world.... and still I returned home. A place of vibrancy and beauty that still inspires me day after day. It is a place that welcomes all, it's Goth weekend as I type. 'Tis truly God's own. p.s I have an allotment and find it to be a truly peaceful and relaxing place to be. Thank you John for your comment which I truly enjoyed reading. I really liked Whitby and hope to return again and perhaps spend a little more time there. I wish I could be there this weekend just to enjoy and absorb the atmosphere.